Its addition in wet concrete slows down the curing process, plasticizes it, and at the same time facilitates its flow. 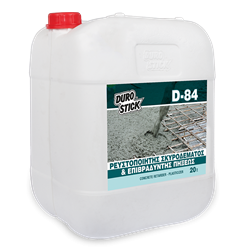 Its use creates the conditions for optimal hydration of the concrete, resulting in an increase of its final strength. Essential for transporting concrete, especially during the summer months. Also, the addition of a small amount in the plastering machines slows down the cure of the plaster in the transfer hoses and improves its pumpability.